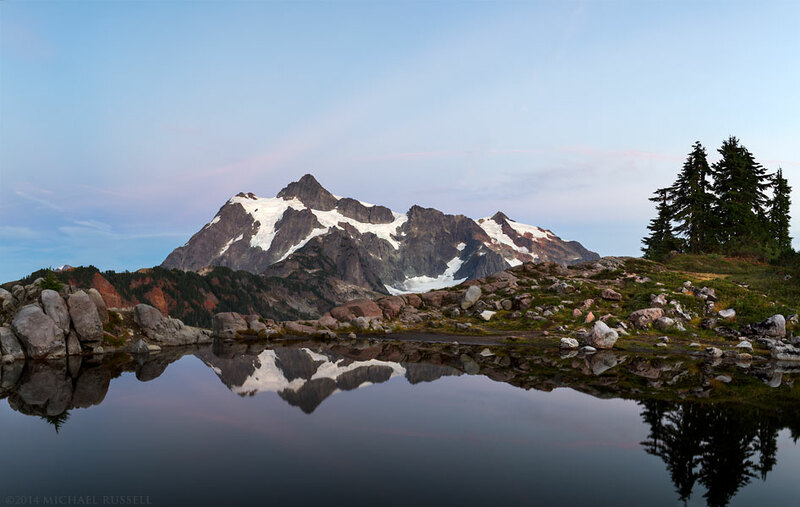 Mount Shuksan reflected in a tarn on Huntoon Point in the Mount Baker-Snoqualmie Forest, Washington State, USA. Last fall I published a number of posts from a trip to the Mount Baker-Snoqualmie National Forest as I traveled up Highway 542 to Artist Point. When you walk SE from the Artist Point parking lot along Kulshan Ridge to Huntoon Point, you may reach this small tarn that can show great reflections of Mount Shuksan. This is not an unpopular photography location, though it is certainly much less photographed than a reflection from Picture Lake. This was my first time at this tarn, and I was treated to very still waters in the tarn that yielded a near perfect reflection of Mount Shuksan. For Prints, Licenses and more photography from this location visit my Mount Baker Snoqualmie National Forest Gallery.